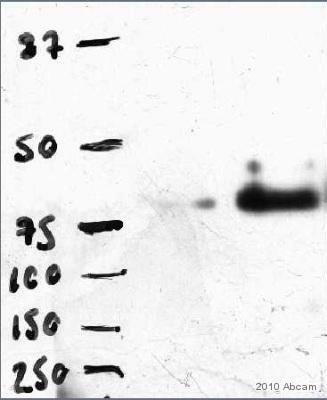 This antibody is expected to recognise the 350 aa isoform only. , corresponding to C terminal amino acids 340-350 of 350 aa isoform DKK3. Our Abpromise guarantee covers the use of ab2459 in the following tested applications. WB Use a concentration of 0.03 - 0.1 µg/ml. Highest expression in heart, brain, and spinal cord. The C-terminal cysteine-rich domain mediates interaction with LRP5 and LRP6. ab2459 staining (2µg/ml) of 293 lysate (RIPA buffer, 30µg total protein per lane). Primary incubated for 12 hours. Detected by western blot using chemiluminescence Ab2459 staining (2µg/ml) of 293 lysate (RIPA buffer, 30µg total protein per lane). Primary incubated for 12 hours. Detected by western blot using chemiluminescence. 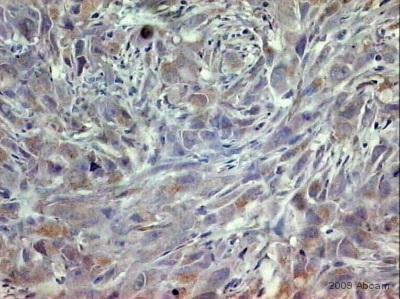 ab2459 staining DKK3 in human MDA-MB 436 cells by immunohistochemistry (formalin/PFA-fixed paraffin-embedded sections). Cells were paraformaldehyde fixed prior to blocking in 10% casein for 30 minutes at 22°C. The primary antibody was diluted 1/75 and incubated with the sample for 30 minutes at 22°C. A biotin conjugated rabbit polyclonal to goat Ig, diluted 1/200, was used as the secondary. Publishing research using ab2459? Please let us know so that we can cite the reference in this datasheet.